Our first view of the Bella Center and our first view of blue sky. Waking up to a crisp, grey yet refreshingly dry morning in 2008’s Most Livable City in the World, we navigated a predominately bicycle traveling commuter crowd on our way to pick up our credentials at the Bella Center(The bike rider factor in this city is off the charts with bike lanes nearly 10 feet wide and the flow of peddle powered traffic often busy enough to make you pause before crossing an intersection.). The first big go out via public transportation in a foreign city is always a bit intimidating but, after an espresso and few awkward moments with a bus driver, we were well on our way. 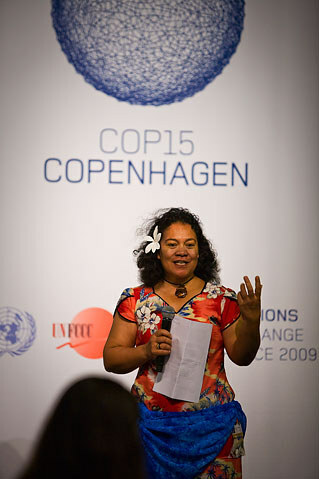 Yvo de Boer is the Executive Secretary of United Nations Framework Convention on Climate Change. 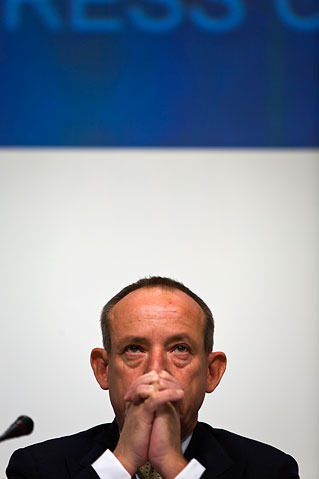 Here he is caught in an accidental moment of prayer during an afternoon briefing with the media about the conference's progress. It took about 20 minutes waiting in a slowly moving line next to a massive wind turbine wing to get into the conference- the sounds of guerrilla street theater performances by activists just beyond the edge of the Bella Center property ringing in our ears- before we got to an airport-styled security check point, flashed our passports to pick up our official press passes, and, after a second security block, made it through to the inside. Instantly, the chaos began. Despite it’s relatively simple, big, block-like exterior, the inside of the Bella Center is anything but. Once past the gates, the understated functionality of the outside is replaced by a buzzing casino-esque labyrinth where, instead of slot machines, gaming tables and randomly located bars, you have exhibition booths from an uncountable number of business and enviro-minded NGOs and activist groups, seemingly endless breakout rooms humming all day with presentations on everything from the impact climate change has on biodiversity in South America’s rain forests to how a successful climate treaty could increase the gross national happiness of Bhutan, closed session negotiations followed by virtually non-stop press briefings from both delegates and science folk on the Conference’s progress or lack-thereof , and, obviously, the corresponding constant click of the laptop tapping masses lurking around every corner. Like I said before, if you don’t have a game plan, you are dead as a polar bear in 2020. The Pacific island of Tarawa, Pelenise Alofa's (pictured) home, is slowly being consumed by rising sea levels. "When I leave Copenhagen" says Alofa, "I want to go back home with Hopenhagen." 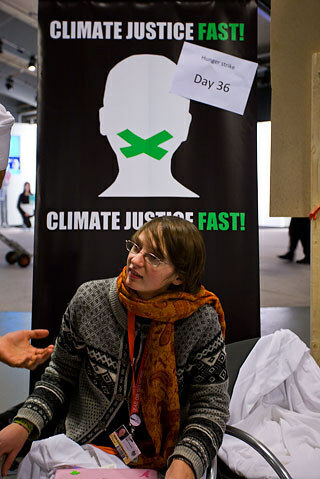 This young lady is from the Climate Justice Action crew. She, as the sign says, hasn't eaten for more than a month. Some of her cohorts are helping organize a "flood" of the Copenhagen streets tomorrow. From there, it was off to the daily afternoon briefing from COP15 Executive Secretary Yvo de Boer. With the first week of the two-week conference nearly complete, de Boer optimistically reported that “Serious work has begun on the core elements that will constitute the agreement that will emerge at the end of this meeting.” And, with the main negotiation sessions betwixt countries closed to media at this point at this point in the process, the large international crowd of journalists on hand had to take his word for it- though the buzz in the hallway out side of the breakout room where the real talks take place was that the initial draft of the climate treaty currently being worked on is inadequate to many involved and purposely being “blocked” from evolving by China and India. 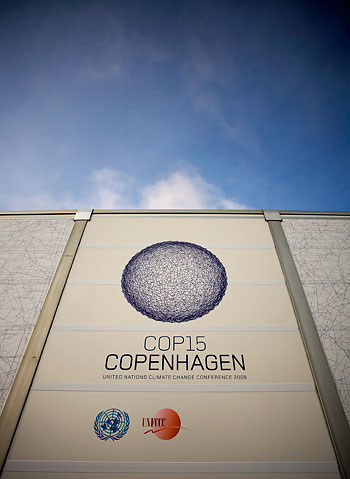 Adding that work on big ticket items like specific carbon emission reduction targets and financing for both mitigation and implementation hasn’t really begun, de Boer pointed that soon more than 118 Heads of State from around the world will arrive to Copenhagen specifically to broker a deal, not prevent one. “It is time to begin focusing on the big picture.” he said. Along those lines, perhaps the biggest news from today was a pledge from the European Union to pony up some 7.2 billion Euros to help finance the immediate implementation of a climate treaty. With de Boer speculating that a legitimate deal would take more than 3 times that amount for implementation purposes alone over the first three years alone, the promise of funding form such a big player as the EU is indeed promising for the process, especially at this early of a stage. “Now we just have to wait and see what other rich countries offer.” explained de Boer. 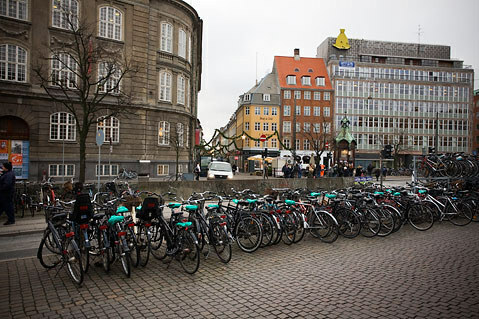 Bikes are everywhere in Copenhagen and most of them aren't even locked. With the United States delegates scheduled to have their turn in the press conference hall shortly after de Boer, Operation Copenhagen was killing time at the near-by and endlessly entertaining Google Earth exhibition when word came of the COP15’s first large activist/police clash near Copenhagen’s Parliament building. Scrambling to the scene, we arrived to a heavy police presence complete with riot gear clad officers, wailing sirens, bus loads of back-up and a helicopter whirling above but none of the “kids in black” that were rumored to be causing the trouble. In fact, the surrounding area had markedly more holiday shopping going down than actual civil unrest. This is the view of the conference's cafeteria area from above. Guess how many laptops?